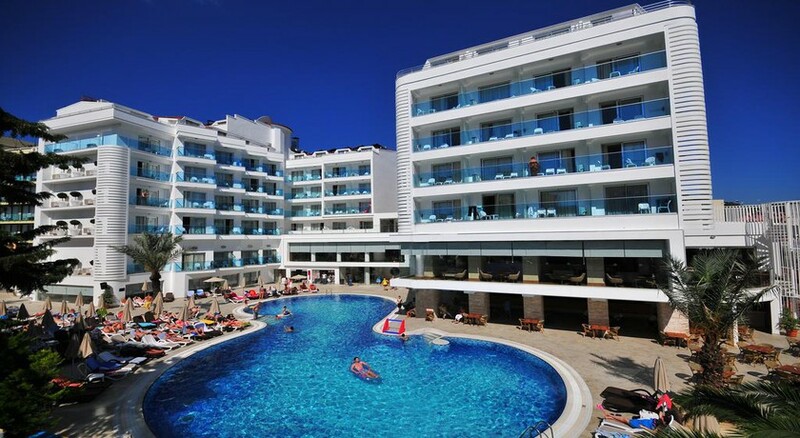 Blue Bay Platinum is a luxury hotel located at the Marmaris city centre and just a 5-minute walk from the beach. It offers modern rooms with balconies and all the essential room amenities. There are 4 outdoor and one indoor swimming pools that come with sun loungers, as well as spa facilities which include suana, Turkish bath and treatment rooms. The hotel has a range of daytime and evening activities to keep its guests engaged, including table tennis, darts, billiards, gym, lounge bars, games, shows and activities. When it comes to dining options, Blue Bay Platinum has buffet and a la carte restaurants, alongside 4 bars serving a range of food and drinks. Young guests too can enjoy a relaxing holiday at the hotel with the children's pool and the kids' club to keep them engaged throughout the day. The property is located at 150 metres from the beach which makes it a 5-minute walk to reach the sunny sands. 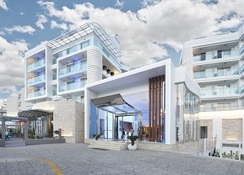 It is close to the Marmaris city centre. The Atlantic water park is at 4-minute walk from the hotel. The Dalaman Airport is about 50 km from the property. The hotel has 441 rooms, which are air-conditioned and have en-suite bathrooms with bath amenities as well as a private balcony or terrace. Rooms are equipped with mini-fridge, telephone, TV, safety deposit box and hairdryer. A daily housing service is also available. Free baby cribs and cots are available upon request. The rooms are categorized as Standard rooms, Triple rooms, Family rooms, Family-2 rooms and Junior rooms. There are also specially designed rooms for disabled guests. The main restaurant of the hotel offers breakfast, lunch and dinner in buffet style. It serves a variety of wonderful dishes of both traditional Turkish cuisine as well as International dishes. The buffet breakfast, lunch and dinner are included in the all-inclusive package and snacks, tea and soup are also available at various timings. The a la carte restaurant Il Primo specializes in Italian and international dishes. 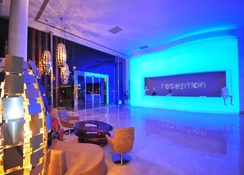 There are 4 bars at the property, which includes pool bar, lobby bar and the main restaurant bar that serves a variety of cocktails, wines and imported drinks. The hotel has 4 large outdoor swimming pools, one of them has water slides. There is an indoor pool which is heated in April and November only. Pools are surrounded by umbrellas and sun beds. There are countless entertainment activities provided by the entertainment team at the hotel. It includes day and night activities, games and shows. Also, there is table tennis, darts, billiards and a lounge bar having a large screen TV showing latest sports events. Internet corner with laptop facility is also available. Blue Bay Platinum has its own spa and sauna facilities, which offer a wide range of services and treatments. These include Turkish bath, pedicure treatment and spray tanning. The hotel has its own kids' club where children between 4 and 12 years can have fun. The club room is air- conditioned and has lots of different games, films and activities. There's also a kids' pool for the little ones. One of the best hotels I have ever been to. The hotel is beautiful and the staff are very friendly. The food was really nice and their was a variety. Pools were very clean and entertainers were doing a good job. Rooms were good looking and clean too. 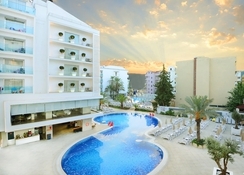 Fab Hotel at a great location in Marmaris. Everything on your doorstep and hotel delivered exactly what it said on the tin for this bargain loving Brit's abroad family.